Please welcome the newest member of the race team, Nick DiBlasi. Nick is relatively new to the whole sport of cycling in general. He’s been road riding for the last 2 years with his wife Megan. Nick got into BMX and mountain biking within the last 4 months. 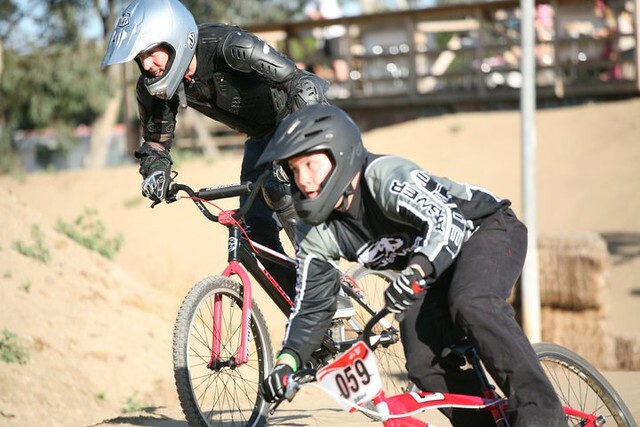 He’s been racing at the Orange Y BMX track in Orange, Ca. His first win and race for biking was during a BMX race last week. With all this talk about BMX, how does Nick fit into the team? The way we see it, we’ve pretty much got all the disciplines covered by our racers, we compete in XC, Super D, Downhill, Single Speed, and Endurance. But there’s been a void that we’ve had this whole time and that’s 4X/mountain cross. Given Nick has some great BMX skills, we’re thinking that he could do some fancy pedal work and bring on some badassery in the name of MtnBikeRiders.com. Nick with the red bike. A little bio on our friend Nick. He’s seen the movie RAD, so that makes him cool already. Plus he’s a Sr Technical Sales person at JE Pistons and has been there for 6 years. Prior to that he owned a fabrication company in Lake Forest where they developed race chassis and engines. Prior to that, he worked for an engineering company in Foothill Ranch doing medical electronics R&D. So do you know what all that means? It means Nick can pretty much make anything out of metal! In fact he and I have been in discussion about modifying my tandem bike, but more on that later. So with all that being said, welcome to the team Nick! One of my good friends, Loren Brewster used to be a BMX race back in his prime. He used to race at the Orange Y track in Orange, Ca. He was pretty decent and even made it up to the Nationals. 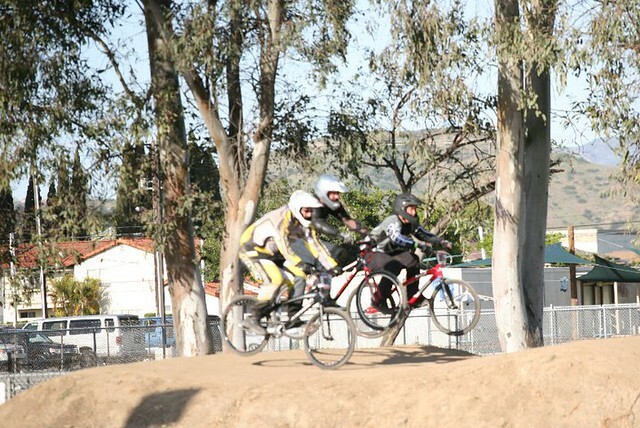 Since I knew he used to ride BMX I figured he’d know how to handle the 4X track in Fontana, Ca. So I asked Loren if he’d be interested in riding the track to see if he still has it going on. On Saturday morning, we drove to Fontucky, suited up and since I didn’t know how to really ride 4x, I followed Loren and mimic his moves. What was cool about our experience, I was able to see Loren become more and more comfortable on his bike…until it had problems. There was a table top that was at least 10 feet long and I wanted to practice jumping over it. I ended up clearing it the first time, and then the second time I cased it on the transition. No harm done, I still felt good because I didn’t have to roll through it. Team Manager for KHS Bicycles sent me some info about Caroline Buchanan winning the World Cup Austrailia 4X Championships. You can watch the action below. A pair of gravity veterans took home the USA Cycling 4X Pro National Championship in Angel Fire, New Mexico on Sunday. Rich Houseman (Temecula, California) claimed the stars-and-stripes jersey for the pro men, while Melissa Buhl (Chandler, Arizona) won the title for pro women. Houseman tore through the newly re-vamped Angel Fire 4X course, besting 30 of the country’s top professional riders. Blake Carney (Camarillo, California), Chris Boice (Albuquerque, New Mexico) and Joseph Backus (Mesa, Arizona) all had impressive performances, blazing through the early rounds and finishing second, third and fourth overall after the final. In similar fashion Buhl earned the national championship over a strong field that included runner-up Neven Steinmetz (Boulder, Colorado) and third-place finisher Jessica Vogt (Boulder, Colorado). Oh and she thinks I’m super rad! Mt. Beauty is the last Downhill National series race in Australia. It rained on race day…in fact, 7 out of 7 national rounds have rained in AUSTRALIA. It’s starting to feel like Europe. Womens DH Results: Tracy Moesly 1st, Tracy Hannah 2nd, Caroline Buchanan (KHS) 3rd. This awesome result placed Caroline 3rd for the Australian National Downhill Series (2007-08). Caroline is only 17 and places 3rd behind two Elite Pro women. Incredible! 2007-08 Australian National Champion 4X Australian National DH Champion and Australian National 4X Overall Series winner. Under-19 Downhill Champion and 3rd place in the Overall National Series Championship (2007-08). We recently received some goods from the fine folks from Blackspire Bicycle Components. The super cool fella, Aaron hooked us up with some parts we needed for the KHS DJ300 bike we’re building up. What you see here are some fantastic samples of a Chain Guide, Chain Ring, The new White C4 Chain Guard. 36T Downhill Chainring,DH/FR stem, and a set of Mr. Chunkie Pedals. Here’s the progress as of yesterday afternoon. But as of last night, I’ve installed all the Blackspire Components, a SRAM 9SPD cassette, rear XT derailluer, Specialized tires and rotors onto the Tag Wheels. We pretty much need a headset and chain, other than that, we’re almost done.